At one point in life, everyone dreamed. We all had grand ideas of what we wanted to do with our lives. But as we grow, life slowly starts to drain the optimism and bravado that accompanied us in our youth. We start to think “realistically” and we begin to “mature”. But does reality and maturity mean we can’t follow our hearts? But sometimes we need a wake up call. We get so caught up in life that we lose touch with what really matters to us. We forget what it means to be exhilarated and fully engaged. 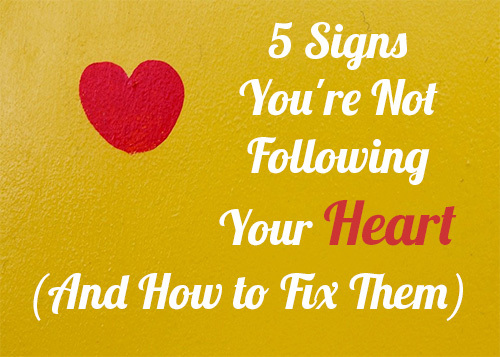 The following are a few signs, and accompanying fixes, that you may not be following your heart. Every morning, you wake up and force yourself out of your warm bed and into the cold darkness of the morning. You drag your feet to kitchen, eyes half open, hoping that your cup of coffee gives you the energy you need to make it through the day. You have no natural excitement about life that’s pushing you to wake up before your alarm goes off. There’s no burning desire that allows you wake up excited instead of miserable. You’re heart’s just not in it. Find something that gets you excited again. Not just a little excited either. But something that gets you so excited that you have a hard time going to sleep at night. Whether that’s a new career, a new hobby, a new project, it doesn’t really matter. But when you’re following your heart, there’s an excitement in life that can’t be duplicated in any other way. You’re at work, and you check the clock only to realize you still have three hours left until you go home. You tell yourself that you’ll wait at least an hour before you check the clock again. You wait, what feels like an hour, only to see a whopping fifteen minutes have passed. So you spend the remaining two hours and forty-five minutes dreaming about what you would rather be doing, and it’s a surprisingly long list of things. But there’s always that one thing that comes to your mind. That one thing you wish you could get paid to do. That one thing you wish you could do more. Do more of that thing you really want to do. It’s really that simple. Now I’m not advocating that you drop all of your responsibilities to go do what feels good. But I’m saying that everyone deserves to do things they enjoy. You need to systematically find a way to stop doing the things you hate, and start doing more of what you love. You’re a passionate vegan working at a butcher’s shop. You’re a creative artist droning away on an assembly line. You have a love for the outdoors but spend 9 hours a day in a cubicle. You love connecting with new people but spend most of your time in solitude. What’s sad is that none of those example are farfetched. So often, people know exactly what it is they’re passionate about, but yet they do nothing about it. Instead they make excuses. They procrastinate. They lose hope. They begin to believe that living a passionate life is fairytale only made for princesses in Disney movies. Rediscover your passions, and then find way to implement them into your life. Your passion doesn’t have to be intertwined into everything that you do, you just want it to have a stronger presence in your life. You’re dad wanted you to be a doctor, you became a doctor. Your mother thought the “neighbor girl” was perfect for you, you’re now married to said “neighbor girl”. You boss thought working 50 hours a week is good thing, you now only work 50 hours a week. Get the point? You can’t let other people make decisions for you, because chances are, they don’t know what you want. They don’t know where you heart is. They don’t know what you’re passionate about. Most of them don’t even really care. You have to be the one who keeps you heart at the center of your decisions. Realize that most people’s opinions don’t matter. No one is in charge of your life, except for you. And it’s easy for people to through out suggestions about what you should be doing with your life, because they don’t have to deal with the consequences. It’s your life. You’re in the driver’s seat. And there’s no reset button for life, so don’t waste it trying to keep other people happy. Follow your heart, do what makes you happy. Many times, following your heart leads down the path less travelled. And it’s scary to know that you may be walking alone. But what are you afraid of? That people are going to judge you? Well I can tell you right now, people are going to judge you no matter what, so at least let them judge while you do something you love. Embrace the solitude that comes along with following your heart. Understand that sometimes, it’s a good thing to stand out. You don’t get remembered for being in the middle of the pack.